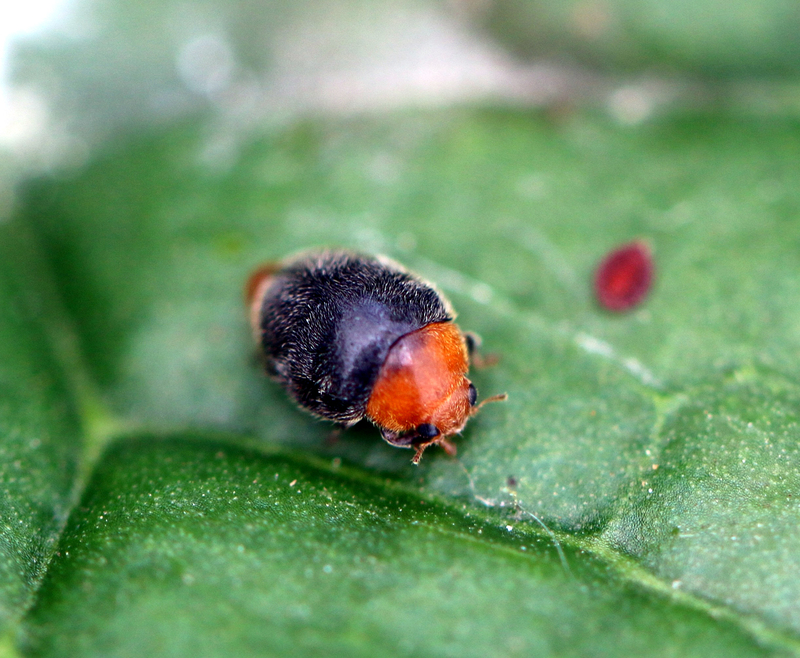 Ontario has several pests for which floriculture IPM programs have yet to be perfected. 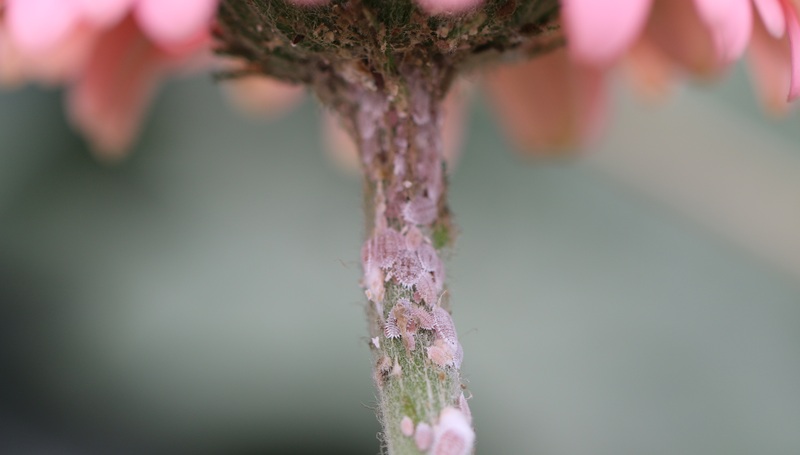 Mealybug (MB) is one, and its incidence seems to be on the rise. This post outlines current control strategies, but more work needs to be done. Two species are generally a problem: the cirtrus mealybug (Planococcus citri) and the long-tailed mealybug (Pseduococcus longispinus). 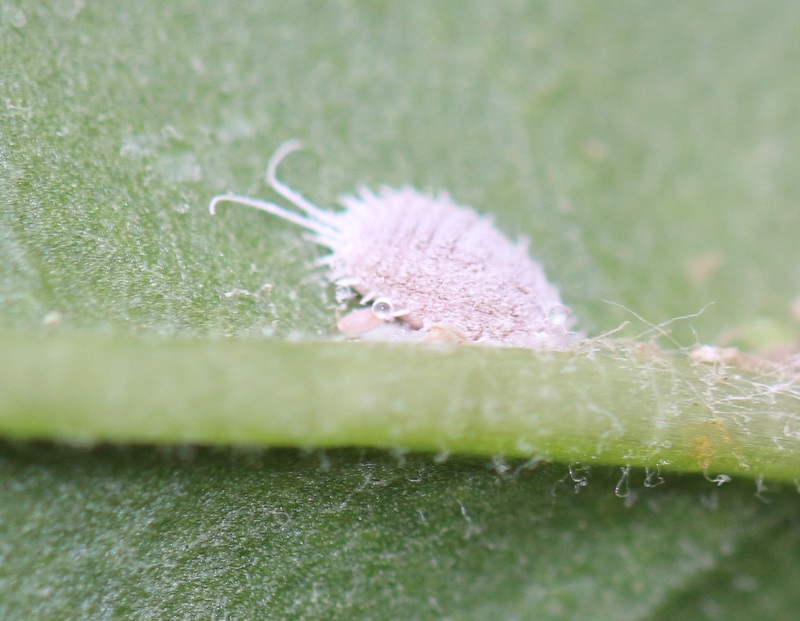 Long-tailed mealybug (older nymph or adult). Photo by S. Jandricic. 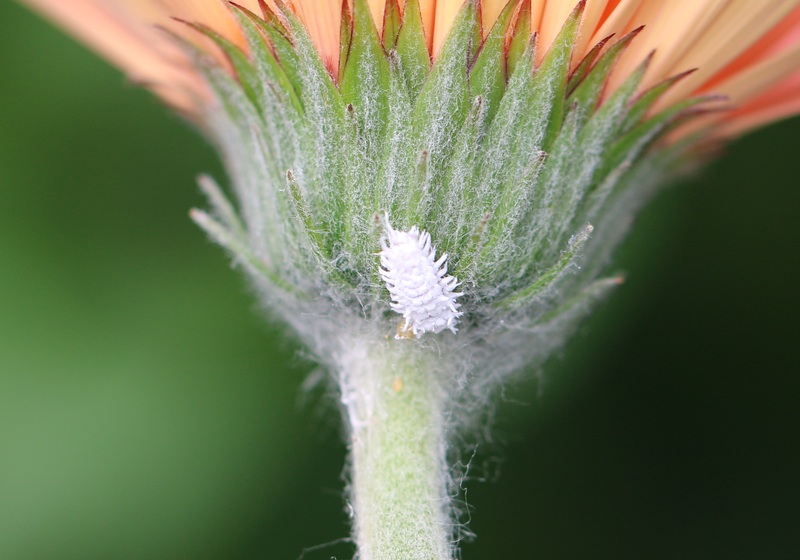 Mealybugs produce unsightly, cottony masses, and produce large amounts of honeydew. 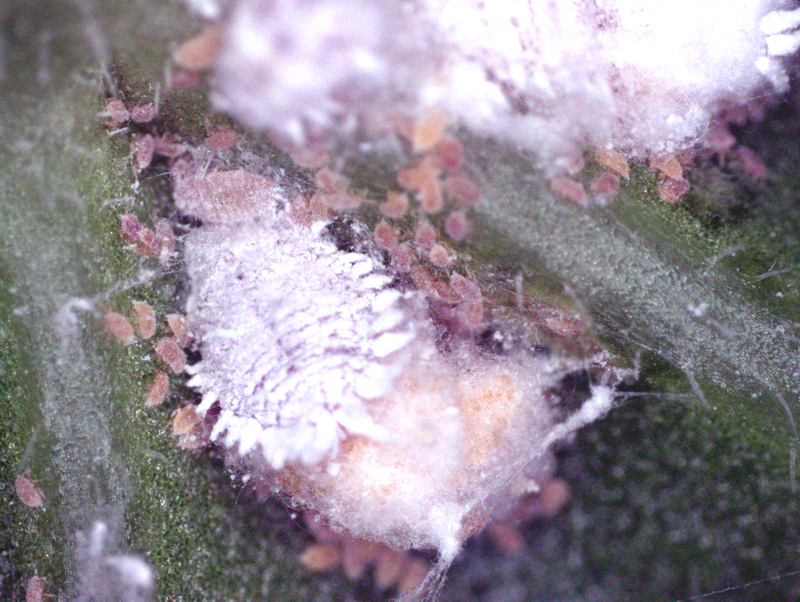 Citrus mealybug adult (white, segmented insect), nymphs (small, pinkish) and egg mass (cottony blob below adult). Photo by G. Murphy. MB control on potted plants is difficult, but is achieved through a combination of pesticides and removal of highly infested plants. Contact pesticides don’t work for MB because of their waxy coating, and systemic pesticides like Beleaf and Intercept aren’t registered for MB. Systemic pesticides also won’t provide complete control, since MB commonly feeds on stems, where active ingredients are less available (see this article). Repeated applications of Landscape oil (which smothers MB) are your best bet in potted plants, and can be applied foliarly or as a dip. Note that EVERY plant variety should be tested for oil phytotoxicity before use. But, how do you control MB in a crop that you can’t throw out, dip, or apply oils to? For cut flower crops, the answer seems to be with Cyrptolaemus (a predatory beetle specialized for MB) and some patience. I recently visited a grower that released high rates of Cryptolaemus larvae in a test area in week 15 to see if they could get ahead of their problem MB this Spring (300 larvae/m2/week for 3 weeks). They also released adult beetles in two houses at a low rate (0.17/m2), with hopes it would establish 1. Even at such high release rates, control was slow – only 5-15% during the first 3 weeks. This is likely due Cryptolaemus’s lower development and predation rates at lower temperatures (avg. 18- 20ºC). But, on week 18, MB control increased to 30%. And, the larvae that appeared in adult-release areas seemed more voracious than their packaged counterparts, cleaning up some plants completely. Now (as of week 28), up to 95% control has been achieved in some areas. We’re hoping the predator will be able to clean up most of the crop by fall. I’ll keep you posted! Warm temperatures. Cyrptolaemus doesn’t function well below 21 ºC; releases probably shouldn’t begin until at least week 18. Other control measures need to be taken before this (we are still working on what, exactly, these should be). Repeated releases. MB produce a crap load of babies (>350 per female! ), so consistent predation is key. Cryptolaemus doesn’t appear to establish in the greenhouse, so repeated introductions are necessary. Patience. Cryptolaemus takes time to build up populations and start doing its job – sometimes several weeks. Growers should monitor pest and predator levels closely during this time, but resist the urge to switch to pesticides. 1 Product supplied by Koppert; insect levels monitored weekly by P. Kelley. Progress of the experiment was also observed by the grower and S. Jandricic. Final release rates worked out to 2-3 larvae/m2 and 2-3 adults/m2; successful rates are likely to vary between crops and situations.